Hello! So day three of my challenge! 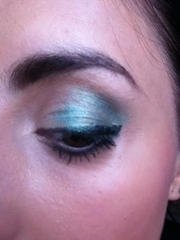 Have gone for a brighter look today, something a bit different that I havent done for a while, green shades! Hope you like this! Heres how I created the look. Firstly I applied my MAC select cover up, as stated in my first look, I apply this all over my lid and under my eye as I feel it gives great coverage and acts like a primer. I then applied my Maybelline Gel Liner going, i opted or a whole line rather then my usual and then applied my base colour all over. 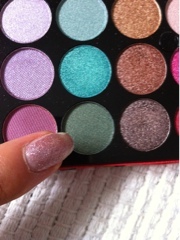 I then chose my focus shade from my accessorize palette, a metallic green shade to do my crease and centre of my lid, I love this colour! 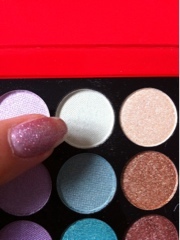 Am going to use this again with other shades. 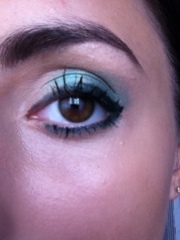 The last shade was a matte dark green for the edge. 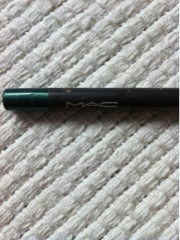 Lastly I applied a line of MAC green metallic liner to my lower lash line which defined the green shades. 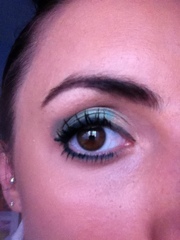 Lastly lashings of mascara and a touch up of MAC select cover up under my eye to catch those dusts of shadow. Oh wow, this colour suits you really well! !